Sweet Samantha has had a rough start to life, being abandoned in Coronado. When she was first brought to the Coronado Animal Care Facility she was shut down and very wary of humans. Thankfully with lots of love and TLC from her friends at PAWS, Samantha has learned to trust and love her human pals, and is ready to share the rest of her life with a special forever family. Samantha has begun to blossom and grow at PAWS. She now welcomes the affections of her human pals and enjoys playing with cat toys. Samantha also enjoys being brushed and welcomes visitors into her habitat for visits and brushing sessions. 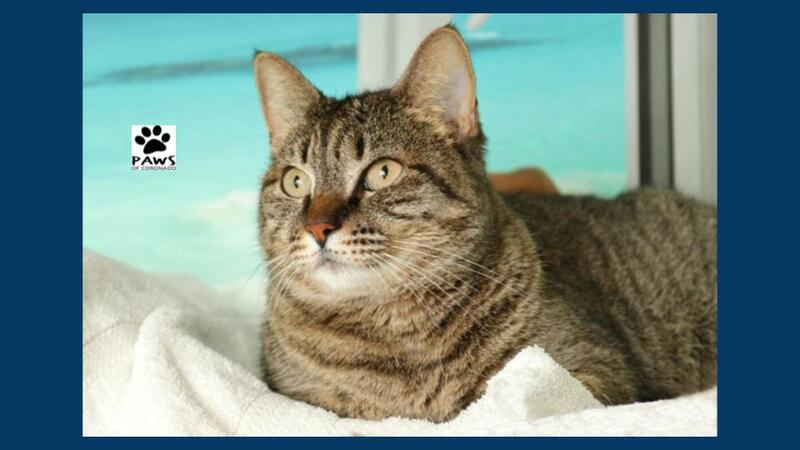 Samantha would prefer a quiet household with no other felines. When Samantha first came to PAWS, she was very shy of humans and seemed especially worried about human hands. She has learned that pets are good! Samantha will need an adopter who is aware of her shyness and understands the need to take it slowly with her. Are you looking for a sweet lady who deserves a second chance? Come meet Samantha today at the Coronado Animal Care Facility. You can contact the cat adoption team through the PAWS website or call Bob at 619-840-9727. And please check out Samantha’s full profile!